Size 3'10" x 5'4"5'4" x 7'8"5'4" x 7'8" Oval7'8" x 10'9"7'8" x 10'9" Oval7'7" x 7'7"10'9" x 13'2"
School Carpets will get you students wild about books! One of the most important facets of a teacher's job is to get students interested in reading. You have to find the right teaching too that grabs their attention and motivates them to open a book. School Carpets promotes reading by creating lovable animal characters that prominently display on the carpet surface. 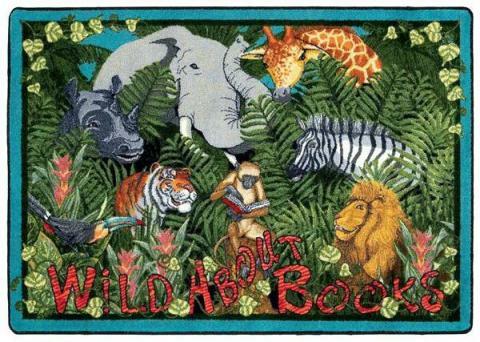 Children will interact with you and each other to discuss the animals and the message that reads, "Wild About Books!" 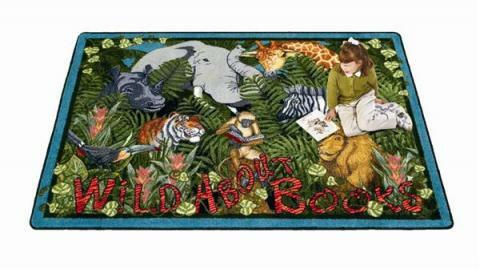 You can use the School Carpets as a teaching tool or as a place for children to sit during show and tell. Whatever the purpose, you never have to worry about juice stains or mud clots ruining the tightly woven nylon fibers. We treat the School Carpets with anti-stain and anti-soil compounds that make cleaning a cinch. For stains, just dampen a towel and wipe the stains away. One swipe of the vacuum will dislodge and catch all of the dirt and mud particles. We construct this carpet to last you well into the next decade.